Sylvia Burt of Chandlersford, Hampshire asked us: "could you possibly track down a recipe for the Australian cakes known as lamingtons?" We went to Bill Granger, one of Australia's best-loved chefs, for a recipe for these chocolate- and coconut-covered sponge cakes. "These are absolutely delicious and wonderfully light," he says, "and as Australian as Dame Edna!" Preheat the oven to 180°C, gas mark 4. Lightly grease and base-line a deep baking tin, measuring about 20 x 30cm. Put the eggs in a bowl and beat for about five minutes with an electric mixer until light and fluffy. Gradually add the sugar and continue beating until the mixture is thick and the sugar is completely dissolved. Sift the flour and cornflour together in a separate bowl. Add to the egg mixture and fold in lightly. Pour the butter and water into the mixture and fold in gently. Pour into the prepared tin and bake for 20 minutes. Remove from the oven, remove the cake from the tin, place on a wire rack and allow to cool. When the cake is cold, cut it into 15 even pieces. To make icing, put the icing sugar, dark chocolate, butter and milk in a heatproof bowl and place over a saucepan of simmering water. Stir constantly until melted and combined. Meanwhile, put the coconut into a shallow dish. Dip each piece of sponge into the chocolate mixture (keep the bowl over the pan of hot water, but off the heat, so the mixture stays liquid), then gently toss in the coconut. 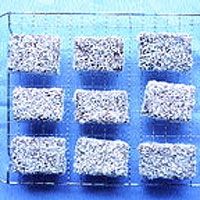 Stand the lamingtons on a wire rack until completely set.